Prince George, B.C. 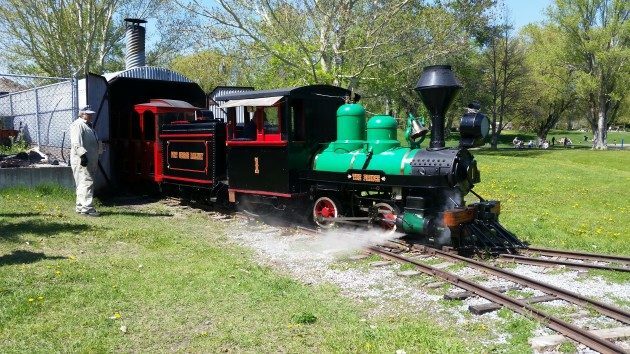 – The Little Prince , the 24″ gauge steam train that operates at Fort George Park is in need of a new home, and some major repairs. Tonight, Mayor and Council will be asked to add the needed repairs to the Capital list, as the existing shed that houses the train needs urgent repairs. It leaks, has no fire exits, the lighting is inadequate and there is a need for more storage and a workspace. The train itself, now 105 years old, needs major repairs to adhere to Canadian Railway Operations Standards. Problem is, since the train is so old, all the parts have to be custom made, and the presentation to Council indicates providing funding and making the repairs without upgrading the shed where the train is stored is “throwing good money after bad”. More than 25 thousand people ride the train each year, it has become a popular tourist attraction. « Previous story: Survive Outside Program Coming to P.G. In the mid 90s to the early 2000s my grandparents ran the train with Walker and at that time that train shed was so inadequate I don’t know how anything could be done in there. The lighting is awful! Just a dark, dreary tunnel which should have been replaced back then. Still a great little train to see going around the park so I hope it’ll get a new home. The city should get on this. Maybe build a building that is reminiscent of the steam era. Kill it like the rolling dome. If it does make some kind of profit, then that profit would be available to build the shed and repairs. Fact they are going to council means it probably costs more to run the train than comes in from ticket sales. So, if 25,000 people do ride it a year, council has to decide how much they want to subsidize these people. And I’m not saying they shouldn’t. Lots of groups get subsidized in this town. The Symphony comes to mind and it’s main customers are generally middle upper class whereas this train appeals more to a different demographic. I know it n some small way at least brings in tourist. but it needs to start paying for itself.